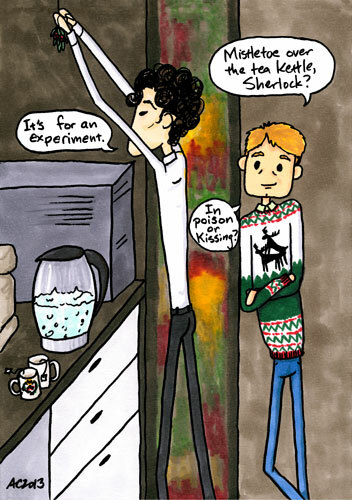 In some ways, this comic was really just an excuse to put John in yet another horrifying holiday sweater. Sherlock’s found some mistletoe to hang up for an experiment, but we’re not sure if he’s after smooches or poison dosages. Either way, John will be on the lookout. This piece is in this month’s Floating Gallery, but was bought by a lovely patron so the original’s no longer available. 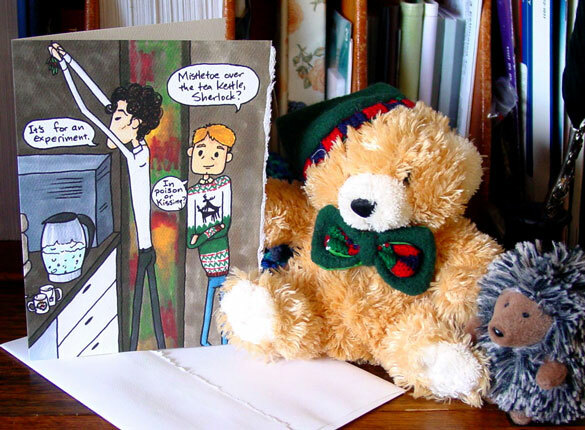 But you can get it on a holiday card in my Etsy shop. Mistletoe Experiment, 5″x7″ pen & ink and Copic marker on paper.